How would you like to give something much needed by the poor? That is to a child or family suffering in poverty across the globe! Cambodia – $136 Medical and psychological support for an abused child. Myanmar – $12 Warm Blanket or $48 Warm blankets for 4 children. Vietnam – $28 8kg of rice seeds and 5 litres of fresh milk or $140 Rice seeds and fresh milk for 5 children. World Vision Singapore is a trusted organisation I support and you can too! The GREATEST gift you can ever give to someone is Love and Hope. In this Life-Changing Gift Catalogue, you will find just that. Instead of getting expensive gifts for friends that will end up tucked away in a corner of their house, why not give a farm of goats or sheep, which World Vision will deliver to needy orphans so they can enjoy fresh dairy produce and income from selling its offspring? The effects will last a lifetime! As you give, you can be sure that someone’s life on the other side of the world is changing for the better because of you. May you find great joy in your heart as you give, and thank you for giving these children a reason to smile. Our Lord is a lover of souls, the Liturgy shows us today. As we sing in today’s Psalm, He is slow to anger and compassionate towards all that He has made. In His mercy, our First Reading tells us, He overlooks our sins and ignorance, giving us space that we might repent and not perish in our sinfulness (see Wisdom 12:10; 2 Peter 3:9). In Jesus, He has become the Savior of His children, coming himself to save the lost (see Isaiah 63:8-9; Ezekiel 34:16). In the figure of Zacchaeus in today’s Gospel, we have a portrait of a lost soul. He is a tax collector, by profession a “sinner” excluded from Israel’s religious life. Not only that, he is a “chief tax collector.” Worse still, he is a rich man who has apparently gained his living by fraud. But Zacchaeus’ faith brings salvation to his house. He expresses his faith in his fervent desire to “see” Jesus, even humbling himself to climb a tree just to watch Him pass by. While those of loftier religious stature react to Jesus with grumbling, Zacchaeus receives Him with joy. Zacchaeus is not like the other rich men Jesus meets or tells stories about (see Luke 12:16-21; 16:19-31; 18:18-25).He repents, vowing to pay restitution to those he has cheated and to give half of his money to the poor. By his humility he is exalted, made worthy to welcome the Lord into his house. By his faith, he is justified, made a descendant of Abraham (see Romans 4:16-17). As He did last week, Jesus is again using a tax collector to show us the faith and humility we need to obtain salvation. We are also called to seek Jesus daily with repentant hearts. And we should make our own Paul’s prayer in today’s Epistle: that God might make us worthy of His calling, that by our lives we might give glory to the name of Jesus. Purgatory is not the linchpin that keeps the wheels of the Catholic system from coming off, as Mr. Gendron and Pastor John MacArthur make it out to be. Was the only reason Mr. Gendron stayed Catholic for all those years was because of his belief in Purgatory? Did he walk around his house saying to himself, “Thank God for Purgatory, or I wouldn’t be Catholic?” I doubt it. All this statement does is highlight the fact that neither MacArthur nor Gendron have a clue as to what they are talking about. “You just keep trying and trying…in a long journey to perfection.” This statement I find quite remarkable. They are actually being dismissive of Catholic teaching that one needs to constantly be striving for perfection. Does Scripture not say, “You, therefore, must be perfect, as your heavenly Father is perfect,” (Matt 5:48). Scripture tells us to be perfect. They laugh at the concept. Also, Jesus tells the rich young man who asked Him about salvation that, “If you would be perfect…,” (Matt 19:21). It also tells us to “strive” for peace and for holiness (Heb 12:14). Yet, Mr. Gendron and Pastor MacArthur denigrate the Catholic Church for telling Christians that we need to strive for perfection. They say that striving for perfection is “pretty discouraging.” I guess it would be for them, seeing as how their salvation came at no personal discomfort to them. They say that the whole process of striving for perfection is “guilt-ridden” and “fear-ridden.” My response to that is: 1) Where is the Bible passage that would concur with their statement? Of course they have to put down the Church that teaches its members to strive to be perfect as the Father is perfect, because in their “churches” they tell their members, “Relax, it’s easy – you don’t have to do a thing.” 2) If we do something that is contrary to the Word of God, to living the life of Christ, should we not feel guilty about it? When we act contrary to God’s will for our lives, should we not feel guilty about it? Apparently not, according to Gendron and MacArthur. Go ahead, sin and sin boldly, and no need to feel guilty about it, because you’ve been saved! 3) Catholics who know and practice their faith do indeed have a “fear-ridden” life – a life filled with the fear of God which is the beginning of wisdom (Prov 1:7) and which is pure and enduring forever (Psalm 19:9). In truth, these gentlemen seem to be saying that not only should you not be striving for perfection, in spite of what the Bible says, but you really don’t need to be striving for anything. No striving to follow Christ more perfectly. No striving for holiness. No striving not to sin. No striving to love God more. No striving to love one’s neighbor more. No need to strive for anything, folks, Jesus died on the Cross, so we’re off the hook. Nothing will be held against us. These guys seem to actually believe that striving for anything – perfection, holiness, etc. – is somehow contrary to the Word of God. Where do they get this nonsense?! Certainly not from the Bible. This is where the concept of cheap grace comes in. Take out cheap grace, and Protestantism “is a hard sell.” Where, in Mr. Gendron’s or Pastor MacArthur’s theological systems, is there room for “denying [yourself]” and “tak[ing] up your cross daily,” (Luke 9:23)? Where in their theological systems is there room for all of us being “changed into His likeness from one degree of glory to another,” (2 Cor 3:18). How can we be changed from one degree of glory to another? If Jesus’ work was finished on the Cross, as Mr. Gendron and Pastor MacArthur believe, then why is it a matter of degrees by which we are being transformed…why isn’t it all or nothing? And, wouldn’t having to pick up our cross daily be “pretty discouraging?” Obviously these gentlemen do not believe one needs to pick up their cross daily in order to follow Jesus. That’s just a bunch of works and we all know that Jesus’ finished work on the Cross does not need to be added to, right? Furthermore, where in their theological systems is there room for Jesus’ statement that the gate to life is narrow and the way is hard (Matt 7:13-14)? Everything for them in regards to salvation is easy. Catholics have this view that the path to salvation is difficult, that you need to constantly be striving to stay on the right path. For Mr. Gendron and Pastor MacArthur, Jesus did it all, they don’t have to do anything. What is so hard about saying a sinner’s prayer and then having your ticket to Heaven irrevocably punched? Jesus says the way to life is hard. Mr. Gendron says the way to life is easy. Who do you believe…Mike Gendron, or Jesus Christ? Fathers can be gentle and warm, but they can also be tough and severe at times. I remember every spanking I ever received from my father — and I deserved every one of them. His hand was large, and so was its impact upon me (no pun intended). The spanking always redirected my behavior and brought about a commitment to avoid such punishment in the future. Because my father loved me and gave me his time and affection, I was able to accept the discipline of love upon my backside. I always had more respect for him at that moment than at any other time. He loved me enough to be tough and demanding. He loved me enough to cause short-term pain to instill long-term character. Love shouldn’t be confused with simply being nice. Though love often includes being nice, “niceness” is certainly not a synonym for real love. Love is often tough and can initially be perceived as hard or insensitive. In a similar way, St. Paul was a father in the faith to the churches who received his letters, and he sometimes had to show them tough love. One particular new church, the church of the Galatians in the far-off land of Asia Minor, heard some of Paul’s harshest words and threats of discipline. He spoke sternly to his children — but he spoke even more severely to their enemies. He spoke with a righteous anger and exasperation to the “Judaizers,” as he called them, who intended to upset the applecart and ruin the souls of his children. Thus Paul stepped into the Galatian situation as a protective, loving father, and he stepped in with both feet. Paul traveled north from Israel into this land and preached the gospel of grace to Jews and Gentiles alike. The Galatians received the word from him “as an angel of God” (Gal 4:14). Nevertheless, after receiving the good news from Paul, they began listening to others from Jerusalem who confused them with heresy. Now “heresy” is an unpopular word today — politically incorrect — but it has been an essential word throughout the history of the Church. The term originally meant a “choice or self-willed opinion,” and it was later used to describe an unorthodox teaching, one that was wrong and damaging and caused division. In this particular case, heretics had come to the Galatians saying Paul was wrong and only presented a partial truth. To understand the great frustrations and drama swirling around this vulnerable new church in Galatia, we must first understand a pinnacle chapter in the Acts of the Apostles: chapter 15. The issue emerging both there and in Galatia involved race as well as religion. It had to do with divided societies and the requirement of the New Covenant to integrate previously separate societies. The Jew and Gentile had to become one in Christ. But how? Some of the Jewish converts said that to become a Christian the uncircumcised pagan had first to become a Jew. They said: “Unless you are circumcised according to the Mosaic practice, you cannot be saved.” Needless to say, this requirement caused many problems and was no boon to evangelism (see Acts 15:1). The confidence of the Galatians began to crumble; they feared they weren’t saved by grace and faith as Paul had delivered it to them. Maybe Paul was wrong! Maybe he had only given them part of the truth. Maybe they should abandon Paul and his teaching. Yet Paul wouldn’t stand for his children’s being dismayed and confused by the traveling heretics and troublemakers. He argued in his letter to the Galatians that circumcision is not necessary, and he scolded them for their “misbehavior” as any loving father would. He got tough! “O stupid Galatians!” he chided. “Who has bewitched you?” (3:1 NAB). Some translations render the Greek term here as “foolish.” But the New American Bible uses the English word “stupid” to signify Paul’s disappointment in their senseless and unworthy lack of understanding. The apostle spoke forcefully to get their attention. And at the end of his letter he was so frustrated with those who were demanding Gentile circumcision for entrance into the Christian faith that he vented his righteous indignation by wishing they would slip with the knife and cut off more than intended — the male organs — saying, “Would that those who are upsetting you might also castrate themselves!” (5:12 NAB). Theology wasn’t the only argument Paul uses in this epistle. In fact, he came at the “bewitched” believers from every angle, arguing from the Old Testament, especially using Abraham as Exhibit One. Was Abraham justified before God by circumcision and following the many requirements of Moses to earn his salvation? he asked. Of course not. When was Abraham justified? Wasn’t it before circumcision, before Moses, before all the 613 laws of Moses? How was Exhibit One justified: as a Jew or a Gentile? Wasn’t Abraham a pagan Gentile from a pagan land? Was God’s first requirement circumcision? No. Was it faith and obedience? Yes. “Abram put his faith in the Lord, who credited it to him as an act of righteousness,” or as other translations render it: “he believed the Lord; and He reckoned it to him as righteousness” (see Gal 3:6, also Gen 15:6, Rom 4:3). So in the courtroom drama that Paul set up, the key witness and exhibit — Abraham — flies in the face of the Judaizers who claim to be his sons but in actuality teach contrary to the example of their father in faith. Abraham’s example demonstrates that the Judaizers were wrong, for preaching the need to “obligate God” through efforts to “earn” salvation. Paul also argued from his own impressive life story. If anyone was knowledgeable of these matters of the law, it was Paul. He reminded them that he had “persecuted the church of God beyond measure and tried to destroy it.” “I progressed in Judaism beyond many of my contemporaries among my race,” he recalled, “since I was even more a zealot for my ancestral traditions” (1:13-14 NAB). He was a Jew of Jews and trained in the Law more than them all. He knew what he was talking about. Did Paul’s gospel contradict what was taught by the apostles in the great mother Church in Jerusalem? No. He had confirmed his gospel with them, he noted, and he had been given the right hand of fellowship by Peter himself. So why were the Galatians listening to and being deceived by the false teachers and heretics? “Are you so stupid?” Paul asked them. “After beginning with the Spirit, are you now ending with the flesh?” (3:3 NAB) — a sarcastic reference to circumcision. Don’t you understand? he pressed. There were “false brothers secretly brought in, who slipped in to spy on our freedom that we have in Christ Jesus, that they might enslave us — to them we did not submit even for a moment, so that the truth of the gospel might remain intact for you” (Gal 2:4-5). The father spoke harshly but truthfully. He spoke with tough love to save his children from confusion, slavery, and damnation. Justification is through faith in Christ, he insisted, which of course includes the aspect of obedience within its very fabric and definition. It doesn’t come through Jewish ritual performed on the flesh. This declaration is the very heart of this fatherly epistle — and the heart of the New Testament. Sadly enough, Martin Luther and others following in his wake interpreted this great epistle of liberty outside of its historical, cultural, and religious context. They anachronistically read into it the Protestant arguments against the Catholic Church. In so doing, like the Judaizers, they misrepresented the full gospel, not by adding to it as the Judaizers had done, but by stripping it of its fullness, an error that Father Paul would have opposed with the same tough love. Romans and Galatians deal with the same themes and arguments. But Galatians is much more personal and impassioned, while Romans is theoretical and formal. Paul knew and loved the Galatians as his own children, while his letter to the Romans was written to Christians who weren’t close personal acquaintances. Galatians may possibly be the “rough draft” for which Romans is the full text. Like Romans, Galatians is an intensely Catholic epistle. The foundations of the Catholic Church lie deep within these letters, and to understand them in their fulness we need to read and listen to them in their native environment — that is, within the heart of the Church as it grew within the milieu of the first century. Several interesting items deserve notice in this epistle. Paul informed us in 2 Corinthians 12:8 that God had given him some physical ailment, a “thorn in the flesh” to keep him humble and to demonstrate God’s great strength even through the ailment. In Galatians there may be clues as to what the “thorn” was. It might have been an eye disease, possibly brought on by the light that blinded him at his conversion (see Acts 9:8). The apostle wrote: “It was because of a physical illness that I originally preached the gospel to you” and “if it had been possible, you would have torn out your eyes and given them to me” (Gal 4:13, 15). Why would he say this if the physical ailment wasn’t related to the eyes? Later Paul concluded, writing the last few lines himself (rather than dictating them), “See with what large letters I am writing to you in my own hand” (Gal 6:11). It seems as though his eyesight prevented him from writing in the finer script of the scribe in the lines that had preceded. The apostle may very well have been legally blind by modern standards. This is a short epistle, probably just a “pamphlet” by today’s standards. But into this brief letter Paul packs incredible passion and content. It’s like a tightly compressed zip file in a computer. Time and work are required to unzip this tremendous piece of literature. In Galatians, Paul’s soul shines brilliantly, displaying his keen logic, his biting and even sarcastic irony, and his tender affection. It’s powerful in every detail. With a little imagination we can envision Paul dictating this letter with the animation of an actor, the tears of a distant parent, and the intensity of a master debater. This is one of his treasures, and few written documents have been loved and studied more carefully. Paul closed with irony and a pun, a clever play on words. He had mentioned his own physical ailment and wounds sustained for the gospel — the marks of the cross, figuratively speaking — and he said: “From now on, let no one make troubles for me; for I bear the marks of Jesus on my body” (Gal 6:17). This claim stood in sharp and pointed contrast to those who wanted to make their marks of Moses on the new believers — marks made with the knife on human flesh. Finally, Paul prayed for them: “The grace of our Lord Jesus Christ be with your spirit, brothers [not the law of Moses on your flesh]. Amen, brothers. Amen” (see Gal 6:18). He ended up by granting them the dignity of brothers, not just of children. But he expected them to live up to that relationship — not only with himself, but with Christ the liberator! Following the conquest of Babylon the King of Persia gives a banquet for his people at which he requests the presence of his wife Vashti. As she refuses the King’s demand Ahasuerus disowns Vashti and goes in search of her replacement. In his harem he meets the young girl Esther who immediately captivates him with her charm and beauty. Unaware of her Jewish heritage King Ahasuerus falls in love with Esther. Esther then reveals to Ahasuerus that she is Jewish and asks him to show her people mercy because of a planned genocide of the Jews by the King’s right-hand man Haman. In doing so she saves the lives of many innocent people and paves the way for their return to Jerusalem. This story from the Old Testament is quite accurately depicted with only minor liberties taken to bring out the rich entirety of the story. 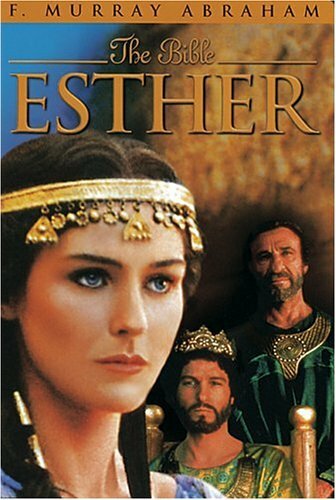 The pretty Louise Lombard was a good choice for her role as Esther as she brought out the graceful, emphathetic, courageous, intergrity, wisdom and dignity of Esther to the silver screen. Also both F. Murray Abraham and Jürgen Prochnow were excellent choices for their roles as Mordecai and Haman respectively. The only gripe I have is the portrayal of King Ahasuerus aka Xerxes ( as in the movie 300 ) because he comes across as young, impetuous, immature, drunkard and a reluctant King! Overall this is DVD movie is still one for your library….. It is wonderful to be with Jesus in another country. And in a catholic church built in 1888! 112 years old.